For tech writer Ashlee Vance '00, the best way to tell the story of Silicon Valley is to visit the Computer History Museum in Mountain View. How to tell the story of Silicon Valley—land of entrepreneurial visionaries, booms and busts, and the quest for machines to extend the farthest reaches of the human mind? For Ashlee Vance ’00, a writer covering tech for more than a decade, a good place to start is across the street from his house in Mountain View, Calif., at the Computer History Museum. The building is part of the story; here once were headquarters for SGI, maker of hardware and graphics innovations that enabled work on the first Star Wars films and provided sought-after speed for Wall Street trading. “Computing moves so fast that people don’t take time to stop and document it,” says Vance, author of Geek Silicon Valley and writer for Bloomberg BusinessWeek. Striving for the new new thing means that there’s a tendency to chew through the old stuff and spit it out. But the museum offers a kaleidoscope history of technology (2,000-plus years and counting) and shows how the ways we work and play have been rewritten by computing, with design aesthetics that range from a wooden abacus to steampunk to the Jetsons. There’s the big hardware from the pre-digital (and even pre-vacuum tube) age, starting with Charles Babbage’s “Difference Engine No. 2,” a massive contraption filled with metal gears designed in the 1830s. (It was only built last decade, to see if it would actually work. It does.) Another hefty device, Herman Hollerith’s desk-sized “Electric Tabulating System,” used punched cards to compile data for the 1890 U.S. Census. Think colossal for IBM’s SAGE system, built in the 1950s (at the cost of $94 billion in today’s dollars) to provide warning against a Soviet nuclear attack. It required hundreds of operators—some who spent mind-numbing hours staring at a screen, watching, waiting. Thankfully, there was a built-in ashtray. 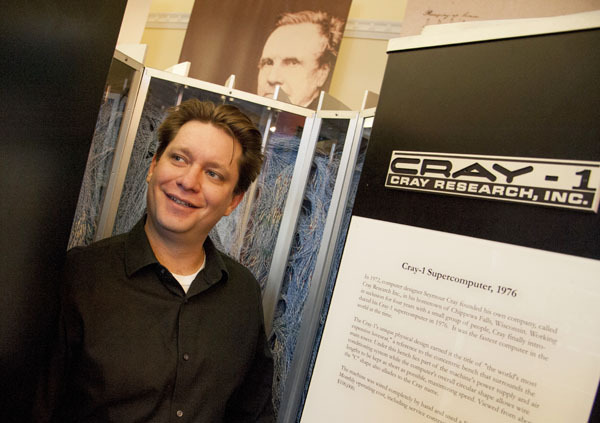 Think cool (including Freon) for the Cray-1, both the fastest computer on the planet after it was finished in 1976, with 60 miles of hand-threaded wire inside, and “the world’s most expensive loveseat,” thanks to a leather bench wrapping around the outside. “It has so much more character than computers today,” Vance says. It’s the story threads that make the museum displays especially compelling, Vance says. Early work on enormous scale wouldn’t have been done without massive government funding. But standing on the shoulders of those literal giants are the smaller machines which, together with a DIY attitude and a late-’60s desire to expand the possibilities of human experience, led to the first virtual reality goggles (1969) and, through the Homebrew Computer Club, the Apple I.